Description: Coloured chart showing East Falkland and detail of French activity in Berkeley Sound. Description: Map of the Falkland Islands explaining their early and contested European discovery. Coloured. Description: Falkland Islands and Patagonia. Decorative borders and insets. Coloured. 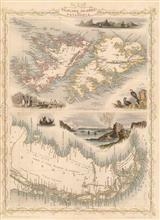 Title: : The Falkland Islands, Surveyed by Capt. Robert Fitz Roy, R. N.
Description: Falkland Islands. Large, detailed map with soundings and annotations from surveys by Captain FitzRoy's 2nd voyage aboard H.M.S. Adventure and H.M.S. Beagle. Printed colour.